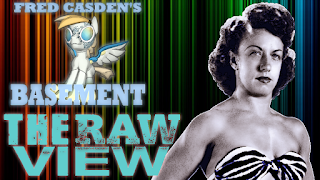 This is a special edition of the RAW View, we're talking wrestling, but we're going back to the 1940s! 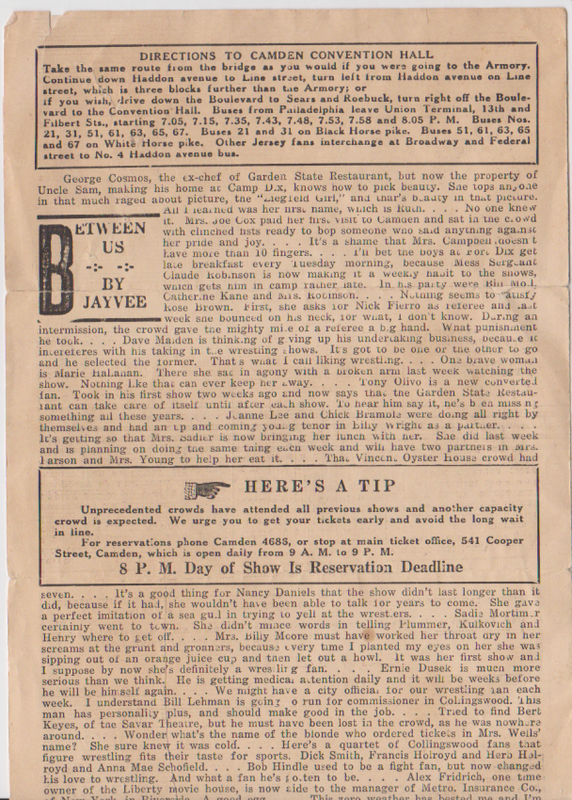 I was recently sent a copy of the print newsletter that was called the Flying Mare which hyped up a big night of action that took place at the old Camden Convention Hall on March 21, 1941! We'll take a look at the front page first, in the video, I did a total read through of this, but some of the text is faded and its creased obviously in some points. The big points of interest are that Joe Cox is on a hot streak, is looking to stay on top and in his last bout, knocked out the referee! Yes there was a ref bump! Also a lot of promoters have been looking to book him vs Leo Numa, and it was considered a big deal to get the match to headline the upcoming show. 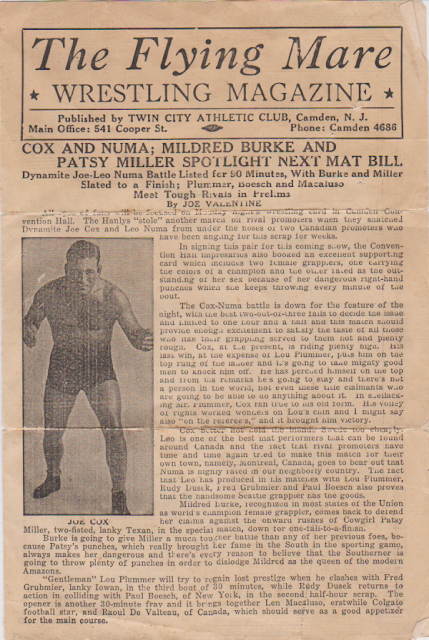 Also of interest is the hype for the women's bout between Women's Champion Mildred Burke and Cowgirl Patsy Miller, who is put over as being a tough contender for Mildred's title with her punching prowess possibly being a huge factor in the contest. Plus, Cox's previous opponent Lou Plummer was looking to get back on the right track in his match,a and that on the under card was Paul Boesch, who would go to run the Houston wrestling territory. The interior is pretty cool, giving a total break down of the card, and two great promo photos for the lady wrestlers. Make note of the 'nicknames' and 'descriptions' some got. 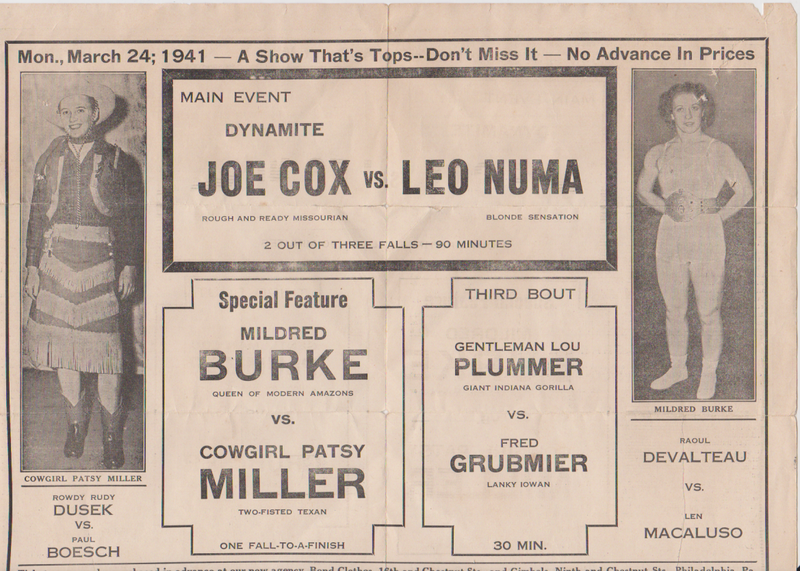 Joe Cox is the Rough and Ready Missourian, Leo Numa the Blond Sensation, Mildred Burke the Queen of Modern Amazons... you can just imagine these folks getting their names announced by Michael Buffer with those epic 'descriptions'. When I first looked at the back, it was pretty obvious there were directions to get to the old Convention Hall, and tips to get tickets in advance... the rest of it I didn't think it was relevant because it was obvious to me until I was reading it out loud for the video, that this was details on some of the wrestling fans that attended recent shows! One was a Mess Sgt at Fort Dix who apparently got back to the base late, another an Undertaker who was picking wrestling over his business, a woman who attended the show with a broken arm.